Goat Island Skiff Amateur Style and the Sea Pearl 21 Too: Mast glued up, rudder and daggerboard glassing. Ok, another frustrating boatbuilding day here in New Hampshire. The mast got glued up today in a long session. It takes a deceptively large amount of glue. First, I laid down the mast ladder frame, with the two sides to be glued next to it. I primed the wood to be glue with unthickened epoxy, and then made up the thick stuff. Application of the glue went along the base plug, narrow staves, and ladder framework. Afterwards, I picked up the ladder section and placed it upside down on the wide stave. The other side of the ladder was then glued up and the wide stave dropped onto that, making a sandwich. Mr. Storer recommends a clamp every foot. I only have 9 clamps that can be used on the mast. Mr. Storer advises his customers to use packing tape... use a clamp, wrap the mast with packing tape to hold the pressure, move on. 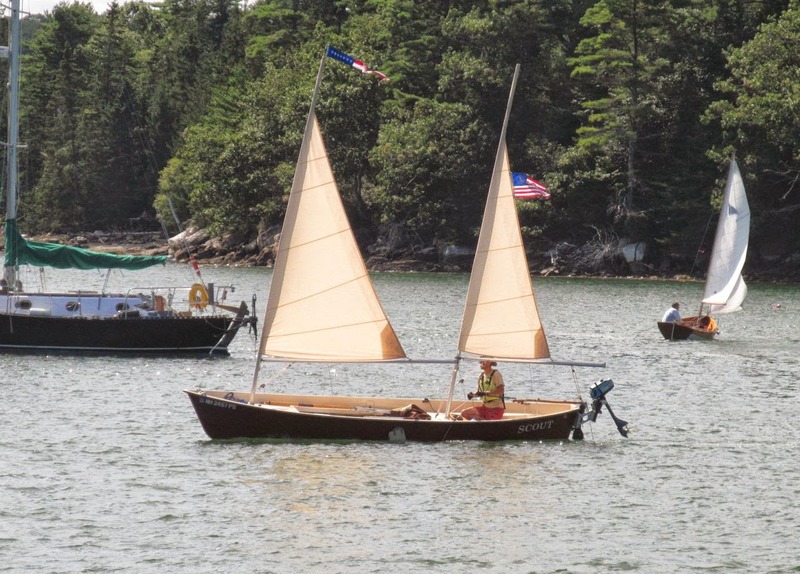 This method has been used by other Goat Island Skiff builders, successfully. It kind of worked for me, but not to the degree I would have liked, the clamps hold more pressure. Regardless, better than nothing, and with some careful maneuvering I was able to make sure that all gaps were closed up. It took longer than I thought, and a lot more glue than I thought. There were a few areas where I really had to force the staves into position, and this was a pain. For some reason I don't have any real overlap in the lower half part of the mast or I could have used nails to hold it in place. I used my muscles instead, and clamped them down, and hoped for the best. In a few locations there's an overlap on one side and an underlap on another... not much, about 1mm, but I see it, and it pisses me off. I should be building to tighter tolerances by now. I don't know if it's impatience to get this done with, or it's a level of meticulousness that drives me batty. Off to check the bottom runners, shall we? In my quest to use less glue (I keep throwing out tons of squeezed out glue) I went with what I thought was a moderate amount of glue... but it obviously wasn't enough. These are, surprisingly, my worst scarfs on this boat yet. This is not the end of the world, I can force some glue in there, they are not necessarily under pressure (that would compromise the scarf) and they will fully glued onto the hull. So this is not the end of the world. My daggerboard. What a mess. I was so concentrated and focused on making sure I got it smooth around the end of the board, I didn't really care what happened along the edges of the glass. I figured I could sand it smooth later. Now, I'm realizing I really screwed myself up the wazoo. This clean up job without going through the soft wood of the board is going to murder my day tomorrow. UGH.